Police in south-west Germany were forced to temporarily close a motorway after it started "raining" money. 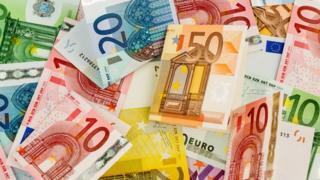 Banknotes were found blowing along the A98 in Baden-Württemberg on Thursday morning, according to local authorities. After a motorist reported the situation, police shut the motorway between Eimeldingen and Weil am Rhein. A spokesperson for Baden-Württemberg said up to €900 (£809) had been recovered, along with a wallet. Jörg Kiefer, press officer at Freiburg police station, said it was believed that a motorist put the wallet on the roof of their car before driving off. Mr Kiefer added that there was nothing in the wallet that would help police identify anyone involved. "They should tell us how much they lost so we can see whether they're the right owner or not."